This Error Message Article explains the BarTender error message “Activation Wizard: Warning Message #6800 The Seagull License Server was not found. The Enterprise Automation edition requires Seagull License Server to be installed and available on the network in order to use this product. It is recommended that you install Seagull License Server prior to activation.” and details how to fix the underlying problem that caused it to appear. 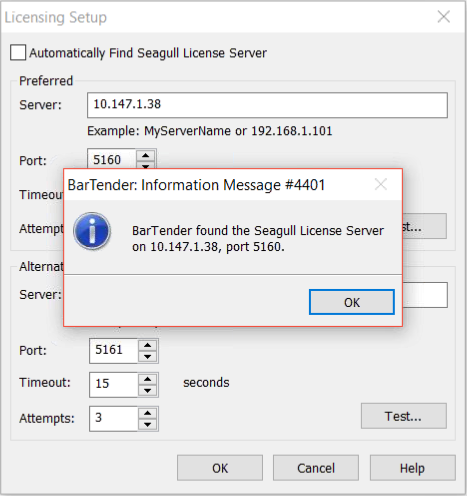 Immediately after activation of the Enterprise Automation Edition, BarTender client will attempt to search the LAN for the Seagull License Server. If it fails, this message appears.